Michigan: FBI officials have arrested a former Marysville pastor who allegedly thought he had set up a meeting with a woman and her 11-year-old daughter to perform "sexual training," bureau officials said. According to a criminal complaint filed in federal court, William Bendert booked a room at a Troy hotel Friday with plans to meet the mother and girl but, the mother turned out to be an FBI agent. 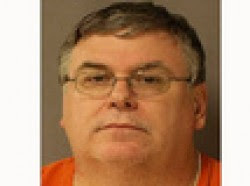 Bendert told the agent he had experience teaching other girls, including a 12-year-old from Ohio and a 16-year-old and 14-year-old from Michigan, according to the complaint. The meetings were described as being "like riding a rollercoaster ... at first it is scary, but the ride is incredible." According to the complaint, Bendert said he would teach the girl various sexual techniques and help her learn about her body. Bendert allegedly said the mother also had to be present and "encouraging" for the girl. Hateful people think that sexual abuse is limited to one denomination or religion. It's a societal issue and happens most frequently in the home, not in churches. But people who hate the church or particular groups love to use that as ammunition. How many schoolteachers have been involved with their students, or scoutmasters with their scouts?